Cheese isn’t the first thing you’d normally think of as a seasonal product, but it very much is. It stands to reason, really – a cheese is the result of the specific treatment of a set of ingredients, and those ingredients will, of course, change given the way that the world changes around them. The diet of the animal that has an enormous effect on the flavour of its milk , so the resulting cheeses can and do change in flavour as the seasons progress and as they mature. 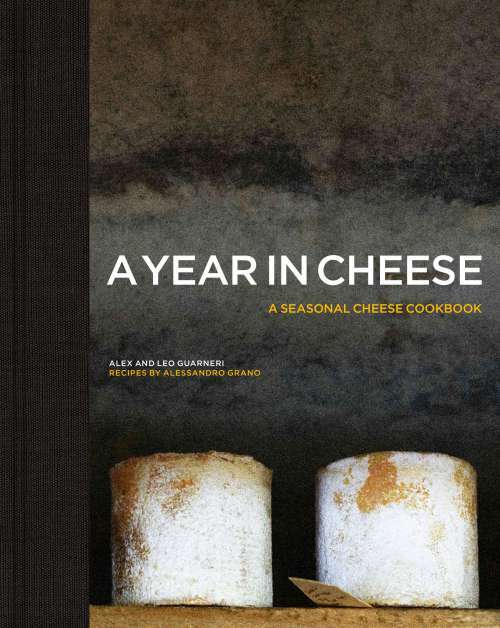 This book, Alex and Léo Guarneri’s A Year in Cheese: A Seasonal Cheese Cookbook is about understanding that principle and embracing it in the kitchen. And what a book it is – a knowledgeable, informed, joyous tour de force of a cookbook that meanders through the light, young goat’s cheeses of spring, through the soft cheeses of summer – ricotta, mozzarella – before turning to autumn’s harder cheeses, the ones that have matured with the year … cheddar, Gruyère and the like, before ending with the big, bold beasts, the cheeses that explode with flavour and depth, such as Stilton, the product of the summer, the spoils of the winter. Each season has its own mood, has its own character and cheeses to go with it, and each chapter in this wonderful book has its own feel, the food developing as the seasons change, from light salads of mozzarella and pickled baby artichokes, right through to hearty stews of beef cheeks, marinated in wine overnight, cooked slowly for an eternity and served with a mash considerably enhanced by the presence of Gruyère. The food is excellent, French in character, ambitious in reach, comforting in personality and tone, and beautifully photographed. Here’s a book that begs to be gazed at and leafed through. My style is very simple. I don’t like having a lot of ingredients on a plate. I like fresh flavours and I want to create tastes that make you feel at home, or that make you feel nostalgic. Alex and Leo Guarneri grew up in Paris, where their mother ran a cookery school, and it’s clear that a love of food runs in their blood. In 2009, they licensed the famous Androuet name – Androuet is a cheesemonger established in Paris in 1909 – and set up a shop in Spitalfields Market, in London, adding a small restaurant, and dealing exclusively in seasonal cheeses, sold in small pieces when the time is exactly right. An alliance with an influential British cheese merchant allowed the brothers to match their sublime French offerings with the best that Britain has to offer. This is a lovely book, a superb collection of recipes with a theme that weaves through them all, a theme that illuminates the real nature of an ingredient that many take for granted. It’s written with passion and love, and really, that’s the very best compliment I can offer.